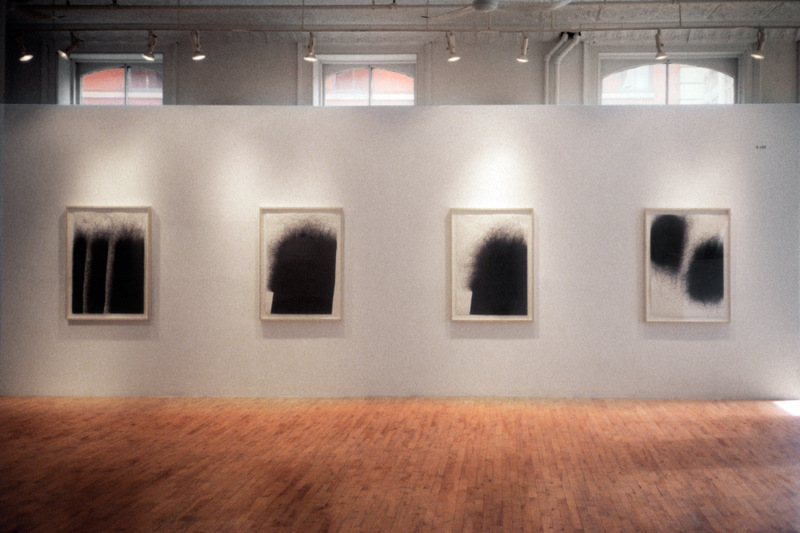 Installation view of IL LEE Line and Form: Drawings 1984-1996 at Art Projects International, New York, 1997. 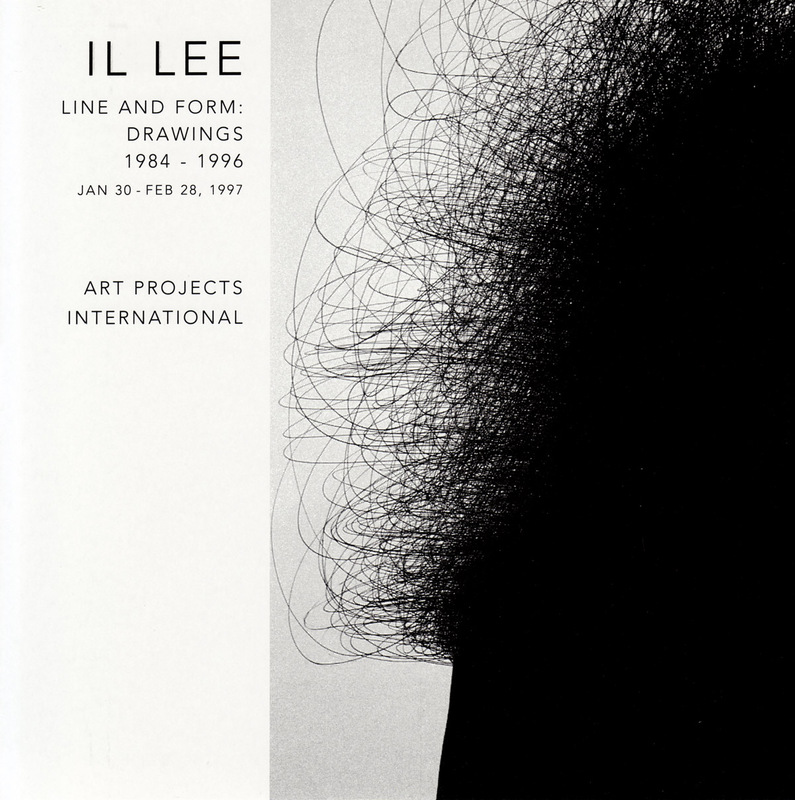 Exhibition invitation for IL LEE Line and Form: Drawings 1984-1996 at Art Projects International, New York, 1997. Art Projects International (API) is pleased to announce a solo exhibition of drawings by Il Lee, a Korean-born New York artist. Line and Form, comprised of selected ink drawings on paper dating from 1984 to 1996, will be presented from January 30 to February 28, 1997 at Art Projects International gallery located at 470 Broome Street at Greene Street in SoHo. Il Lee draws with ball point pens. He attains abstract forms through hours of wielding these humble instruments. Some of these forms have the simple clarity of black paper cutouts on clean white paper. Other forms—just at the edges—reveal, in small flurries of escaping swirling lines, the means of their production. And some forms are all together edgeless; they are the areas of greatest density of furious tangles of ball point pen rendered lines. Il Lee reinvests minimalist and abstract art making with new life by re-imagining the way this art is made. That the solid black color of a form drawn on white paper has been made by compiling single line upon single line causes a viewer to reexamine the simplicity of a simple geometric shape. The wavering or unwavering edge of an abstract form is now unquestionably not arbitrary. Il Lee invites the viewer to learn about a form as he must have learned about it in the slow process of its creation. His approach is informed and rigorous. 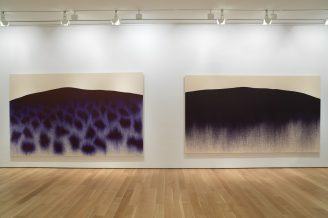 Il Lee first developed his craft in Korea in the seventies at height of minimalist painting’s presence. In these unique works on paper the best of the spirit of Minimalism lives. And though he creates a lexicon of impenetrable objects and a great range of undecipherable atmospheres he does not deviate from the parameters of his particular venture. Figuration is not present; no faces appear through amassed lines. Other media do not encroach; no black paint eases the task of blocking out a form. Without distraction the viewer can keep returning to the realization that every element of Il Lee’s drawings — from their overall feel to their particular marks and shapes — is created from the single medium of a ball point pen’s line coupled with Il Lee’s imagination. The viewer can go from the whole to the particular to, again, the whole of each work without being waylaid by any randomness in the artist’s process or intent. And Il Lee, with this ascetic approach, allows a viewer (jaded or otherwise) to appreciate the full potential of his drugstore-basic medium and to buy into, once again, an appreciation of form and line.